Although Lawyers are under increasing pressure to be mobile, transparent, and organized, many are not billing sufficiently to live the lifestyle they want. Solo lawyers and law firms regularly lose money tracking time and expenses, billing, and organizing documents and calendars. Cloud-based practice management solutions are often suggested as a way for lawyers to increase efficiency, track costs, and get paid properly while keeping your clients happy. But do the benefits of using technology outweigh the costs in time and money? 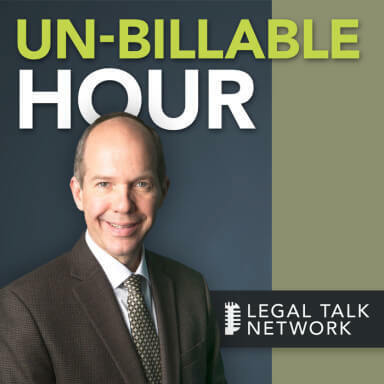 In this episode of The Un-Billable Hour, Christopher Anderson interviews Susan Harman from LexisNexis Firm Manager and attorney and analyst David Houlihan about how practice management technologies can benefit the performance of lawyers and law firms. Susan discusses how problems like disorganization, slow response to clients, late billing invoices, and not tracking time can result in greatly lowered efficiency and less overall revenue. With practice management solutions, lawyers can spend much less time on menial tasks and track how much time spent on each case – very useful information if they have fixed fee billing systems. David talks about his research on how law firms can address problems of underperformance. His research showed that lawyers save 4-8 hours a month with practice management systems and spend an average of $540 per year, resulting in a large return on investment. Although these technologies clearly increase efficiency and are beneficial to law firms, many attorneys are hesitant to change their processes or take time for training. Susan Harman is the vice-president and product champion for LexisNexis Firm Manager. She believes in building products that have been designed by the user and that work with the user’s current processes. David Houlihan is a Massachusetts attorney and analyst with Blue Hill Research. He is an experienced advisor in legal technology with a unique understanding of complex information environments and legal business needs. Christopher Anderson: Welcome to the Un-Billable Hour, the law practice advisory podcast, helping attorneys improve their practices. We’re glad you can listen today on the Legal Talk Network. I’m your host, Christopher Anderson. I am an attorney with a singular passion for helping other lawyers be more successful with their law firms. I work directly with lawyers across the country to help them achieve success in their law firm businesses. I build and manage law firms in Georgia and New York, created an innovative software for lawyers at LexisNexis, as well as served as a prosecutor in New York City. As a business owner first and as an attorney, I believe you should have a law firm that works for you. In this program, I have a chance to speak to you as I do in presentations across the country about what it takes to build and operate your law firm like the business that it is. I have the chance to introduce you to a new guest each month to talk about how to make that business work for you instead of the other way around. Today’s episode of the Un-Billable Hour is 7 ways to overcome underperformance. My guests today are Susan Harman, she’s the vice president and product champion for LexisNexis Firm Manager, and David Houlihan, who’s a Massachusetts attorney and analyst with Blue Hill Research. David is an experienced advisor in legal technology with a unique understanding of complex information environments and legal business needs. Susan, would you just like to introduce yourself a little bit more? What more can the audience know about you? Susan Harman: Well, I really believe in building products that have been designed by the user that works the way the user works. And so when we built LexisNexis Firm Manager, we incorporated the input of thousands of attorneys and actually changed many components of it based on building it the way attorneys work. I brought that to LexisNexis because I used to work at Intuit, very well known for building products that meet the needs of users and I formally worked at Apple as an executive introducing new product functionality. And the last thing is that I worked for two law firms as a business partner. Christopher Anderson: Excellent, thank you. And David, what can you tell us to round out the introduction I gave about you? David Houlihan: Great, yeah. I would say the basics or my job now is I’m an attorney, but my focus is on researching the use of technology by law firms in support of legal departments. I spend every day speaking with technology buyers in firms or departments. Generally managing partners, general counsel, CIOs if they’re there; understanding the process and the experience with using technology to support business. Christopher Anderson: Great, thank you. We’ll be sharing a little bit more about how you can get in touch with Susan and David at the end of the show. But today we’re going to be talking to Susan and David about some of the causes that law firms struggle to make the profits that they should, and the 7 ways to overcome underperformance; or as Susan was mentioning earlier, to optimize performance of their law firms and overcome some of those struggles. So welcome, Susan and David. Let’s start off with the title of the program that you delivered today at ABA Techshow which was the 7 ways to overcome underperformance. What is it that law firms need to overcome? Susan Harman: What they need to overcome is not billing sufficiently to live the lifestyle that they want to live. Most attorneys in small law firms are under billing by about 40% of their hours. That’s significant, and there’s little ways and little things that attorneys could do to try to recoup some of that loss income. Christopher Anderson: And David, I know Blue Hill has recently completed a study regarding how law firms can address a problem of their underperformance or how they can optimize their profits using a variety of tools. Can you share two or three key findings from that research? David Houlihan: Yeah, sure. So the study looked at 47 law firms, all under 50 attorneys, trying to understand how practice management impacted the business. I’d say the major findings really relate to attorney efficiency. We found, per attorney, about 48 hours reduction in non-billable time per month, and a conversion rate of non-billable time to billable time of 20 to 100%. Christopher Anderson: Wow, that’s amazing. And do you believe that’s causing problems with profitability in those firms from that research? David Houlihan: I would say the opposite. Really what it’s about is we think of attorneys as the material asset of a law firm in the manifestation in the services they provide. To Susan’s point of that optimization, really, it’s about reducing the total amount of hours work and increasing the percentage of that it has built. Christopher Anderson: So in your presentation today, one of the ways that you discussed for law firms to optimize that performance is to become tech-savvy but not be so worried about becoming a tech guru. How can that help a law firm? Susan Harman: By using technology and being users of it so that they’re not designing the software but they’re applying the technology to their practice. So, for example, having a practice management solution that takes care of the billing for them. That reduces the amount of time that they’re spending on billing because that’s non-billable hours. Another example is having a practice management solution that has built-in calendaring that syncs with all of their devices. Calendaring is the errors of the number one area for malpractice claims. Another area of using technology is tracking your time and expenses. An ideal solution would automatically track all of your activities and then let you know which ones you haven’t associated a time and expense with. So those are just a couple. I think that maybe the last and the most important is nowadays your clients expect you to be mobile. They don’t care where you are, if you’re on the beach or at a soccer game. When they call you, they want you to give them an update on their matter. And by having a mobile device – and most attorneys today, over 91%, have mobile phones and tablets, but they don’t use them to connect with their practice management solution. So having those devices connected to a secure Cloud practice management solution lets them service their clients and obviously be more responsive to the clients, encourages the clients to want to pay them when their invoice comes in. Christopher Anderson: That makes sense, and you said that they shouldn’t go as far as to try to become a tech guru. Why that differentiation? Susan Harman: So you didn’t go to law school to become a tech guru or an IT person. You went to law school theoretically to practice law. And there are people that went to school to become IT people. And so you want to practice law, let the professionals, the IT folks, the practice management consultants, the technology vendors recommend the technology solutions and take care of the technology solutions. But just the last point, nowadays with the easy to use Cloud practice management solutions, you really don’t need anybody to help you. It’s just pretty much plug it in, and you’re ready to go. Christopher Anderson: Yeah, and it makes sense. The ABA on their Ethics 2020 Commission has promulgated just a comment to Model Rule 1.1 that lawyers now in order to maintain confidence, they should keep abreast of changes in the law and its practices, but also in the benefits and risks associated with relevant technology. So what you’re saying is exactly that. Be aware of it, understand it, but necessarily have to get deep into the machine. Susan Harman: Right, take advantage of the professionals, the practice management advisors, attend the shows and events, try out demos ahead of time. Susan Harman: Key performance indicators. Christopher Anderson: To improve profitability without even having to bill more hours or get more clients and they could actually improve the law firm profitability without more business by paying attention to KPIs. Susan Harman: KPIs, or key performance indicators, are basically the metrics that businesses use to run the business. And so what that means is that law firms today have to run their practice as a business. They have to pay attention to their billable hours. If they’re charging a fixed fee, are they actually making money or are they exceeding the number of hours that they should be associating with that fixed fee. So some examples of KPIs are things like leveraging your staff. Are you having your junior people work on the administrivia so your more senior people can work on the more complex initiatives, or go out and get more new clients? A margin: are you keeping track of the money you spendt? Be able to know whether or not you’re making money. And your realization rate, what is the rate at which you are billing and collecting and getting paid on your invoices? Christopher Anderson: Yeah, because your billable hour rate doesn’t mean that much if you’re not collecting those dollars, right? Susan Harman: Right, and what we’ve learned in a recent study by LexisNexis is that most attorneys have past due clients and in fact over half have 39% of their client base past due. Christopher Anderson: Oh my goodness, 39% of all of their clients are past due in one way or another? Christopher Anderson: Wow. And that’s on top of what I think you said at the beginning of the program, that they miss 40% of their billables all together. Susan Harman: Yes, and that’s why optimizing your law firm is so critically important. Because the thing is, with the past due invoices, it’s not due to clients’ bad financial situation. It’s due to the practices of the attorney. It’s not having a billing process, not having clear invoices that communicate what the work was that was done, it’s not sending out the invoice in a timely fashion. When you send out an invoice that’s 3 months past the service that was performed, the client is not likely to pay because they’ve forgotten the value. Christopher Anderson: Right, they take it as seriously as you did, apparently, in setting out the bill. David, can or has your research shed any light on these points about being tech savvy and about using KPIs to optimize their business? David Houlihan: Yeah, certainly. I think that as we looked at the research, if I look across the conversations that we’ve had, I think everyone is aware that these problems are there. The challenges really are the transparency of what these problems mean to the business is lacking. So consistently, we hear from folks that have practice management that don’t have practice management. They know they want to increase attorney efficiency, they know they want to reduce the IT costs of the organization. The problem becomes that they don’t really understand how to make that transition. A lot of that is a lack of measurements. To Susan’s point about KPIs, I think really the first step is for firms to understand. And I would start even more basic than what she’s talking about. I think everyone measures unbilled and billed time, but understanding the amount of days that takes you to produce a bill, the amount of days it takes you to get paid; what’s your DSO? David Houlihan: DSO is outstanding. That’s how long from the issue of your invoice until you’ve been paid. When you start understanding measuring this time, you can start making comparisons of what the costs to your firm actually are. Because when we talk about investing in software, it’s really a tradeoff of those costs. You’re going to accept whatever the cost is of the solution with the hopes that those costs plus other reductions to your firm are going to outweigh the, essentially, the cost of doing nothing. Christopher Anderson: So the first step in accurately managing your business by these numbers is recording the numbers. You have to have to have something to measure. David Houlihan: Yeah, and nobody wants to do it, and nobody wants to do it because it’s manual. It’s sort of a chicken and egg problem, the solutions oftentimes help with measuring those things, but I think that it’s important before firms take the plunge to really start to measure and take the time. Christopher Anderson: And it sounds like it’s really about learning to live inside those systems and do everything through them so that the data is recorded just by doing the work, just by living inside those systems. Susan, your third and fourth points in your presentation actually talked about tracking time and billing, that was like a real focus of what you were talking about. How can it help law firms and businesses to keep accurate track of their time for billing purposes but also for cost purposes? Susan Harman: So related to – I think it’s the cost purposes, I think it’s what I said earlier, nowadays is fixed fees. So people think, okay, it’s fixed fee, I don’t need to keep track of my time. But you really do because you don’t know if you’re exceeding the number of hours that were allocated to that fixed fee. So you could actually be losing money on every single fixed fee matter. And so that’s why it’s really critical to track your time. Christopher Harman: I think you also talked about the loss of time, when people don’t track their time contemporaneously, there’s a lot of time leakage. Susan Harman: Yes. It’s really important to track your time when it happens, and that’s what’s so wonderful about practice management solutions that will do that for you. Because people do not track their time and the biggest culprit is that 5 minute phone call that you have. If you add ten 5 minute phone calls, that’s a significant amount of time, and that contributes to that 40% of unbilled time. Christopher Anderson: Yeah, and the longer they wait, the worse it gets, right? Susan Harman: The longer they wait, the less that they will remember what their time is and that’s the big problem. But again, that’s why having solutions that have features like Money Finder that will track their tasks and activities for which they didn’t associate their time really helps. Christopher Anderson: David, we’re going to go to a break right now and hear from our sponsor, but when we come back, I’m going to ask you whether the pain points of failing to record time contemporaneously and the ability to capture that time showed up as pain points in your research. Christopher Anderson: So, David, when we took the break, we were talking to Susan about the pain of losing time, time leakage, by failing to record time, and also about how an alternative fee arrangements or flat fees, failing to understand the time that goes into an hour or into a case leaves attorneys not being able to understand whether those cases are profitable. Are those pain points that showed up in your research? David Houlihan: Yeah, absolutely. I think it depends on the size and indication of the firm, but I don’t think we even need research to say that, I can tell you from practice. You know, if our bills are do at the end of the month, I did my time at the end of the month, it tracked it on paper if that’s sophisticatedly. And you make the estimates, you lose the time, and no one wants to bill clients too much so you round down and you don’t get paid for that. So really understanding that time makes a big difference. When we looked at the firms that participated, a lot of the time that was lost, that nonbillable time they were doing – especially in smaller firms – is just time spent putting together bills and doing estimation process and we have folks spend whole days that they lose that they should be practicing law that they’re putting together numbers. Christopher Anderson: Thank you. So Susan, you followed up with a billable problem with the need for law firms – small law firms in particular – to get organized; to get organized with their files and to get organized with their calendars. How is the lack of organization or the failure to truly get organized impacting these law firms? Susan Harman: I think as I said earlier, the number one malpractice problem and complaint is lack of calendar organization. And a malpractice claim can cost as much as $100,000. So that’s something that sounds very trivial, but is critically important, and it comes back to being organized. Most law firms are piles of paper everywhere, and when a client calls you want to be able to put your finger on it. Most attorneys will take 15 minutes to just find a file and you translate that to your hourly rate and if that happens every day, that’s a significant amount of money. That could be upwards of $11,000 that you’re losing just by not being able to find a file. Christopher Anderson: And you’re also not being as responsive to your clients when that happens and in a world where everybody expects you to have information immediately. Susan Harman: And that’s another leading Bar complaint in many states is not being responsive to clients when they call because you can’t put your finger on their information. Christopher Anderson: What can law firms do to help them get more organized with their files and with their calendar? Susan Anderson: It’s quite simple, again, having a practice management solution. Because practice management solutions are all in one solutions. It has all of your matters, all of your contacts, all of your documents, all of your calendar items. It’s basically everything in your practice available to you anywhere. And so it means you don’t have to have the piles of paper and you can be very responsive. Christopher Anderson: And a lot of lawyers I think already do have some sort of calendar, right? They use Outlook calendaring or they use their iPhones or something like that. How does it help them to have the calendar based in their case management and doesn’t it add another layer of complexity? Susan Harman: Not really because nowadays the practice management solutions are automatically synced. And so the benefit of that is if they’re all tied together, no matter where you are, you know all of your appointments. Nowadays, docketing dates will automatically appear if you’ve got a solution like Law Toolbox and something like Firm Manager, they’ll automatically appear on your calendar, so wherever you are, because they’re synced, your calendars are talking to one another. Christopher Anderson: Interesting. So David, Susan’s explained really well how case management software can help law firms with these problems that she’s identified and they sound like serious problems. Being disorganized, not being able to respond to clients, not getting bills out on time, not tracking their time. But your research actually looked at the return on investment in using these tools, is that right? Christopher Anderson: What did you learn about the return investment for law firms that want to adopt some sort of case or matter management technology? David Houlihan: I’d say that the starting place is really to understand those comparative costs. So we did a survey of practice management solutions, understanding the various subscription rates that were involved with them and we created a median rate of $540 per user per year. So that’s going to vary based on the size of your implementation and obviously the vendor. But that was an average across the market. So we compared that to the results that we saw, the impact from solutions. So if we just take attorney time, so 48 hours a month per attorney, just put that in a solo practitioner. That gives us a fairly good range per month over the year. Christopher Anderson: That’s how much time you think by using one of those tools is saving those attorneys? David Houlihan: 4,000, yeah, 4,000 at the highest in the conversion, that’s correct. If you look at that, ROI is a measure of the differential of what you spend and what you get back. And typically when we do our research in other areas of enterprise technology spend, you see roughly a 600 to 1,000% ROI. So because the cost, particularly of the Cloud solutions that are aimed at small firms, because that cost is so low per user, you get a much larger ROI. I think that should be relevant in a number of ways. One, just looking at what you think the upside of the investment is, two, understanding what the risk of the investment is. We found four to eight, that doesn’t mean every firm’s going to find that; some will find more, some will find less. But knowing that that’s the range and knowing that’s the percentage difference should give a little bit more of a sense of security in making the investment. Christopher Anderson: In calculating the ROI, did you also look at the implementation costs, what it actually took to stand up to software in the first place? David Houlihan: We didn’t. I would say that by and large, I had someone come up to us after the presentation and thought the training costs were about the same as the first year investment. That may be right, I’m not sure, we’ve never really looked at it. Christopher Anderson: But these ROI numbers, it would seem to leave a lot of room to enable some of these implementations. David Houlihan: Yeah, and what’s important about that, the implementation costs, the time that’s lost, is that’s your first year cost. That’s going to be immortalized over the time of the investment if you keep building and using that solution. Christopher Anderson: And Susan, I think you were saying with these online software, has the implementation gotten easier? Susan Harman: Yes, these new online practice management solutions really do not require training. They’re so easy to use and if people want training, they have online guides. And so there really isn’t a big implementation cost. Probably the biggest cost or challenge is just getting your data in if you’re already using an existing system. But there’s really no training because these systems are easy to use. Christopher Anderson: So would you say that users – especially for the main things that you’re talking about, the capturing of time and the getting bills out much more quickly – those seem like things that you could be able to turn around and get a pretty quick return on at least those items while you implement the rest of the system. Susan Harman: Right, and actually that’s what we’re seeing is when users first use a system like Firm Manager, the first thing they’re doing is capturing their time and expense and sending out invoices. And so that’s what actually more than pays for the monthly cost of the solution. David Houlihan: Yeah, I think that’s important and also for folks to set a range for what they’re really doing, how much data they need, et cetera. It doesn’t all have to happen at once, you can sort of filter your way in. Christopher Anderson: Great, well thank you all. That wraps up this edition of the Un-Billable Hour, the law practice advisory podcast. Our guests today have been Susan Harman with LexisNexis Firm Manager and David Houlihan with Blue Hill Research. Susan, would you just give the audience the website for Firm Manager and how they can contact you on social media? Christopher Anderson: And David, do you have a website or social media contact information where our audience can reach out to you? David Houlihan: Yeah, the best place to come is BlueHillResearch.com. On social media, I am DWHoulihan at Twitter. Christopher Anderson: Fantastic. Thank you both very much for sharing the information and for the presentation here today. This is Christopher Anderson, I am looking forward to seeing everybody in the audience next time with another great guest on the Un-billable Hour. Remember, you can subscribe to all of the editions of this podcast at LegalTalkNetwork.com or on iTunes. Thanks for joining us and we’ll speak to you again soon.